Source: Mennonite Encyclopedia, v. 1, p. 47. 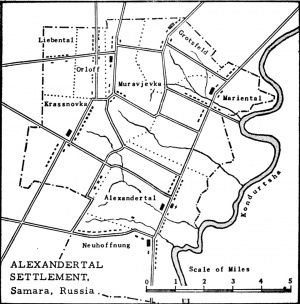 Alexandertal Mennonite Settlement (sometimes called Altsamara), the last of the original Mennonite settlements to be founded in Russia, was located in the district and province of Samara (from 1935-1991 Kuibyshev), on the left bank of the Volga River. The distance from the edge of the settlement to the town of Samara was about 85 miles (140 km) and to the Volga 56 miles (90 km). It lay somewhat to the northeast of the intersection of 54° latitude and 68° longitude on the Kondurtcha, a tributary of the Sok, which flows into the Volga north of Samara. The leader of the colony was Claas Epp, Sr., who was also one of the founders of the Am Trakt settlement in 1854 in the southern part of the province of Samara, also on the left bank of the Volga, opposite Saratov (father of Claas Epp, Jr., who led a group to Central Asia). The immigration to Alexandertal began on 20 August 1859, and was not finished until about 1870. The Russian government put a tract of some 26,500 acres at the disposal of the settlement, measuring ten miles (16 km) from north to south and eight and a half miles (14 km) from east to west. The settlers were Mennonites of West Prussia, who stemmed from the Grosse Werder district east of Danzig, and from the Graudenz lowlands farther up the Vistula River. The first villages founded were Alexandertal and Neuhoffnung, followed by Mariental, Grotsfelde and Muravyevka. Each settler received a plot of 65 desiatinas (approximately 175 acres). Later came the settlement of the villages of Orloff, Liebental, Schönau, Lindenau and Marienau. At the beginning of the 20th century the last three named united into a single unit under the name of Krasnovka. The later settlers received smaller farms of 32 to 40 desiatinas. The colloquial language of these settlers was exclusively German; the original immigrants retained their Plattdeutsch, but with few exceptions the children were taught High German. Farms were given only to the Mennonite immigrants. With them had come a number of families of smiths, carpenters, cabinetmakers, shoemakers, and tailors, mostly Lutherans with a few Catholics, who received no land, but were given home sites on the communal land. The lands taken over by these settlers were steppes inhabited by nomad Asiatic tribes: Bashkirs, Kalmucks and Kirghiz, remnants of the Mongolian invasion of 1240-1480, who retreated back into the trans-Caspian steppes when Ivan III (the Terrible) annexed these regions into the Muscovite empire, whereas the Tatars of the Kazansk hordes settled here. The colonized area rises from the Kondurtcha, along which the meadow of the colony lay, toward the west and forms a rolling hilly landscape crossed by some forests and groves. The soil consists of a layer of humus (black) about 28 inches in depth on a subsoil of red clay. The land is very fertile and has adequate precipitation; all sorts of grain thrive on it: wheat, rye, oats, barley and millet, as well as potatoes and vegetables. The climate is continental with very warm summers, so that watermelons thrive, and cold, snowy winters, which are gradually growing milder. The transitions in spring and fall are usually short. Winter begins in November, and the spring sowing begins 1-15 April. In a wide arc west and north of the Alexandertal settlement were the Lutheran settlements with a sprinkling of Roman Catholics; most of these settlers came after the Polish revolution of 1863. Whereas in the north and south the colonial land bordered immediately upon native Russian villages, and in the east was bounded by the Kondurtcha, in a wider circumference were the villages of new colonists from the southern provinces of Russia, most of them from Ukraine, and interspersed with them some Baltic settlements. Then there were also the villages of the Mordvinians, Russians, Chuvashes and Tatars, from which the Mennonites recruited their laborers. In the north, only about three and a half miles (5 km) from Mariental was the large market town of Koshki (which was also the postal center of Alexandertal), where one could hear seven or eight different languages spoken on the weekly market days. With few exceptions the Mennonites were farmers. Most of the immigrants brought with them some capital and were able to buy neighboring unsettled land. The farms were isolated as they had been in West Prussia rather than in the village pattern, and about half of the buildings were of massive stone, and the rest of logs. There were no closed villages. Since the colony was so far removed from distribution centers and also because at the time of settlement Russia was producing an oversupply of agricultural products, land was correspondingly low in price. In the first years of the settlement a farm could be bought for 600-800 rubles ($300-$400); at the turn of the century cultivated land sold for nearly ten times that price. Beginning in 1895 an upward trend was noticed in financial prosperity, brought about by Russian export of grain and the organization of a dairy cooperative by the Mennonites, who engaged experts from Estonia to manage it. Several years later Bernhard von Bergen, one of the members of the cooperative, took over the organization and established on his land another at Mariental, while an Estonian cheesemaker set up dairies in Orloff and Krasnovka. Another factor in producing prosperity was the opening of a railroad line extending to Melekess, a town thirty-five miles distant from the colony, which made it possible to import seed wheat from Sweden (since the varieties the colonists had tried were not very successful on the soil of the colony) and to organize a profitable business in farm machinery. The native population in a very short time had adopted the methods of the German farmers. In 1910 the bridge over the Volga was begun, and the railroad line completed from Melekess to Asiatic Russia, which passed the colony about three miles away, touching the market village Koshki. Pogruznaya now became the station where the colonists shipped their produce. All of these factors contributed to the financial prosperity of the colonies before World War I. In the wake of prosperity enterprise increased. Mennonites built and prosperously operated power mills in and beyond the colony. Various kinds of shops and factories for the manufacture of farm machinery and soap were established. In the early 1880s the Mennonite farmers bought the Rettungstal land complex, which bordered on Lindenau. This land had been assigned to Lutheran settlers, but had never been occupied. Individual Mennonites bought farms in Starey Buyam, Kolyzovka, Bessovka and Alexandrovka, and settled on them. And finally in 1898 a group of young Mennonite farmers took over in hereditary lease with option on purchase, a large tract of steppe land of about 4,900 acres three miles from the railroad station Bezenchuk, forty miles (65 km) from Alexandertal in the south of the Samara province. Other fields were bought from the Russian natives, until finally about 27,000 were in the hands of Mennonite enterprise, besides the equal amount of land in the mother colony. The first village school was built in Neuhoffnung by the people of Alexandertal and Neuhoffnung. Similar schools were built in Mariental, Muravyevka and Krasnovka. These schools were supported and the teachers paid by the villages. At first only German was taught in these schools; under Alexander III (1881-1894), however, in the train of the program of Russianization, the Russian language became compulsory. Whereas the immigrants could speak very little Russian, their children mastered the language. The secondary school (Ministerial-Schule) instituted by the Russian government in Alexandertal also contributed to their mastery of Russian; the teachers were paid by the government, and the buildings were maintained by the colony. In 1917 the colony took entire charge of this school, making it a Fortbildungsschule with the program of a Progymnasium. For purposes of insurance the Alexandertal colony was a subsidiary of the Molotschna Mutual Fire Insurance Company (fire elder after 1895 was Heinrich Görz). Alexandertal had additional agencies for insurance against hail, theft of horses, hauling and the replacement of grain lost by fire. In 1907 an agricultural union was formed, which maintained experimental fields and worked for the improvement of horse and cattle breeding. The village of Alexandertal was the center of the settlement. It was the site of the secondary school, the church, and the regional government, since the colony constituted a closed political unit or volost and closed community or Gemeindebezirk. In the early days of the settlement religious services were held in a sod hut, then in the Neuhoffnung village school and in a private house in Mariental, until the church was built in Alexandertal in 1866. This congregation had about one thousand souls including the children. Services were all held in German. Ministers were chosen from the congregations and received no salary. The first elder was Dietrich Hamm, born 12 December 1814, in Fürstenwerder in West Prussia, ordained to the ministry at Ladekopp, West Prussia, in 1852, ordained an elder in Alexandertal in 1862. He was followed by Jacob Toews, Mariental, and at his resignation by Johann Wiebe, Schoenau, then Jakob Regehr, Mariental (born 1841 at Heubuden, West Prussia), who served the congregation until 1918. He was succeeded by his son Eduard Regehr and when Eduard was exiled by the Communist government, by Heinrich Penner, Alexandertal, who was the last elder of the congregation. Church discipline was exercised in the congregation. Religious instruction was given in the secondary school by the ministers. The congregation was a member of the Allgemeine Mennonitische Bundeskonferenz and was visited by traveling evangelists. It contributed to the support of the school for the deaf in the Molotschna, the mental hospital Bethania, the mission of the Dutch Mennonites in Sumatra and Java, and also did missionary work among the native population of the neighboring villages. The needy of the congregation were cared for by deacons. In 1877 some of the members joined the Mennonite Brethren, leaving the Alexandertal church. When their numbers were large enough, this group built a church at Mariental. But since the Alexandertal church was also the social center, the new group no longer felt at home in the colony, and many immigrated to other settlements. The Revolution of 1917 caused serious unrest, which could at first be settled by skilled negotiations, but soon threatened the economic and religious life. At the time of the New Economic Program there was a religious revival, in which about half of the losses of membership were regained. But arrests were made more and more frequently by the new government; uneasiness caused some of the colonists to emigrate. In 1929 with the execution of the policy of the "general line," or complete collectivization and liquidation of all private ownership, came the group exile of Alexandertal colonists to the compulsory labor camps along the Arctic, to Siberia and Kazakhstan, where many found a premature death under the most difficult conditions. In the colony area the settlers remaining were forcibly united into collectives. Epidemics and catastrophic starvation snatched many away. During World War II the remnants of the Alexandertal Mennonites were without exception banished to Kazakhstan and other regions, so that the colony has been liquidated and has ceased to exist. Fast, Viktor, ed. Vorübergehende Heimat: 150 Jahre Beten und Arbeiten in Alt-Samara (Alexandertal und Konstantinow). Steinhagen: Samenkorn, 2009. Hege, Christian and Christian Neff. Mennonitisches Lexikon, 4 vols. Frankfurt & Weierhof: Hege; Karlsruhe: Schneider, 1913-1967: v. I, 22 f.
Harder, Bernhard J. "Alexandertal Mennonite Settlement (Samara Oblast, Russia)." Global Anabaptist Mennonite Encyclopedia Online. 1955. Web. 20 Apr 2019. http://gameo.org/index.php?title=Alexandertal_Mennonite_Settlement_(Samara_Oblast,_Russia)&oldid=146355. Harder, Bernhard J. (1955). Alexandertal Mennonite Settlement (Samara Oblast, Russia). Global Anabaptist Mennonite Encyclopedia Online. Retrieved 20 April 2019, from http://gameo.org/index.php?title=Alexandertal_Mennonite_Settlement_(Samara_Oblast,_Russia)&oldid=146355. Adapted by permission of Herald Press, Harrisonburg, Virginia, from Mennonite Encyclopedia, Vol. 1, pp. 45-48. All rights reserved.